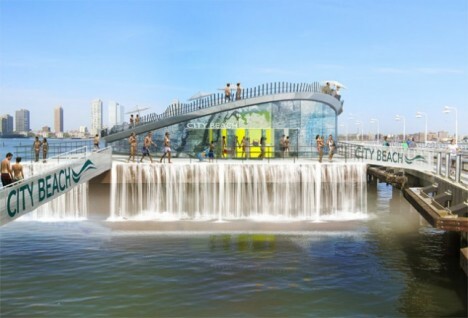 While the waterways connecting the five boroughs of New York City are already home to everything from food-producing barges to boats reclaimed as hotels, they could become an even more productive part of the urban landscape, harnessing clean energy from the tides or hosting floating, human-powered gyms. These 9 river-based proposals include pier-based parks, floating swimming pools that filter river water, and a retro-futuristic vision for an airport on the Hudson. 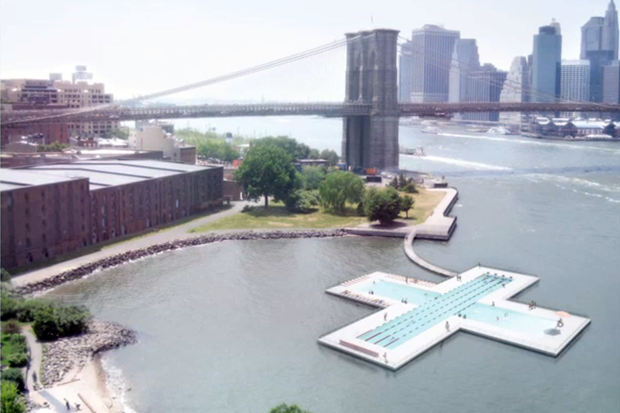 A swimming pool shaped like a giant plus sign could provide a cool place to swim in Manhattan’s various river parks while simultaneously filtering and purifying river water. The four separate ‘arms’ of the pool enable different activities, from a lap pool to a shallow area for kids. 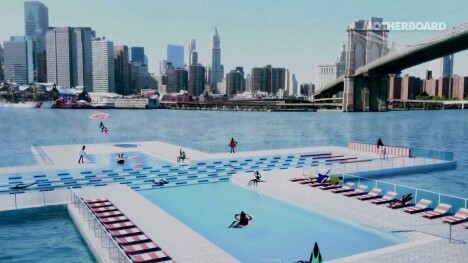 The pool walls are made of a stack of materials that collectively screen odors, pollutants and bacteria to make Manhattan’s notoriously uninviting waters safe to swim in. It may look like a dream, but the concept is well on its way to becoming a reality, with the designers raising nearly $275,000 to get started. It’s far from the first floating pool to come to New York City; such attractions were popular as far back as the 19th century and the city has maintained a conventional chlorinated one at Barretto Point Park in The Bronx since 2007. 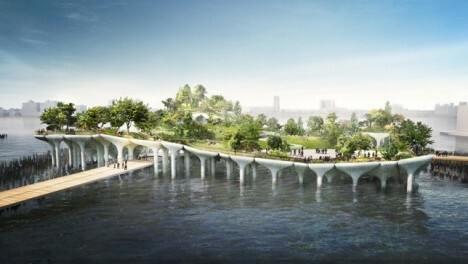 The Hudson River could get an artificial island of sorts in the form of a new architectural wonder from Thomas Heatherwick’s London-based studio. 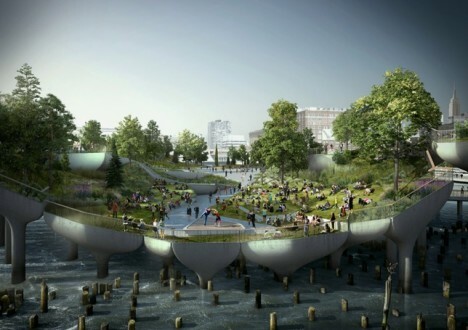 Funded by a non-profit organization started by fashion designer Diane von Furstenberg and her billionaire media mogul husband Barry Diller, Pier55 is a 2.7-acre park with footpaths, grassy lawns and an 800-seat amphitheater, and is supported by 300 concrete pylons. The project is pending approval from the Army Corps of Engineers and expected to begin construction in 2016. 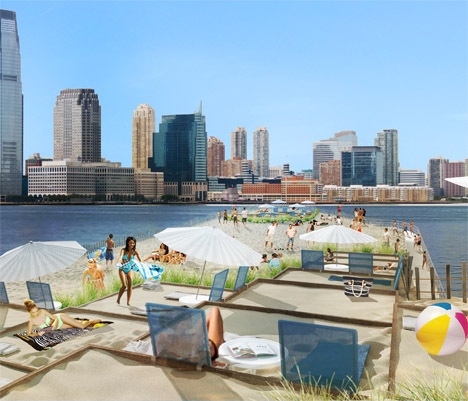 New York City residents who want to lounge in the sand needn’t leave Manhattan at all if the City Beach NYC project ever comes to pass. 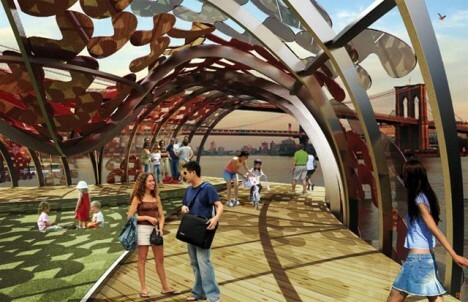 Essentially a floating beach park on a barge, the project aims to create a two-level destination with shops and restaurants placed underneath a curving, sand-covered platform overlooking the waters of the Hudson River. 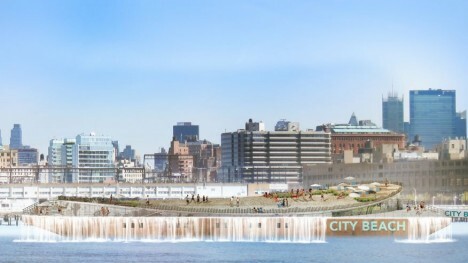 Since you don’t exactly want to swim in the Hudson, the purpose of the park is more sun bathing than actually getting wet, though the design includes a large water feature to mimic the sounds of the sea. 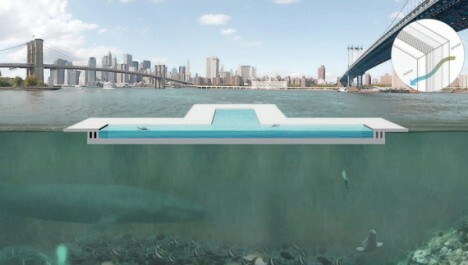 The barge would be permanently moored on the west side of Manhattan. Unfortunately, the creators were unable to raise enough funds to hire a team to get started. Want a view of something other than terrible reality television while you’re cycling or running on the treadmill at the gym? You could be gazing up at the skyline instead, or taking in the sights of the Hudson and East Rivers, from a “soft floating micro-island gym’ powered by human motion. 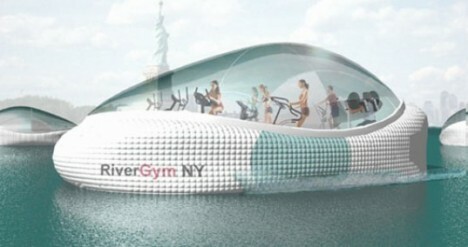 The River Gym is a series of small floating facilities programmed on a specific path moving from one point to the next, so they also serve as transportation. Each is equipped with onboard purification devices to help mitigate water pollution. 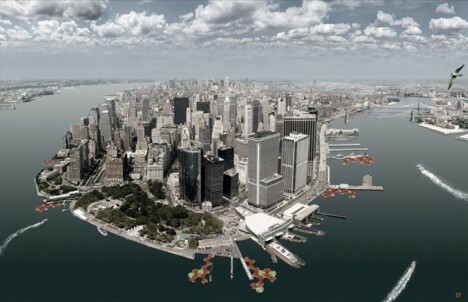 Energy-producing docking stations ‘plug in’ to New York City’s existing piers in this concept by local firm GRO, developed for the Metropolis Magazine Next Generation design competition. 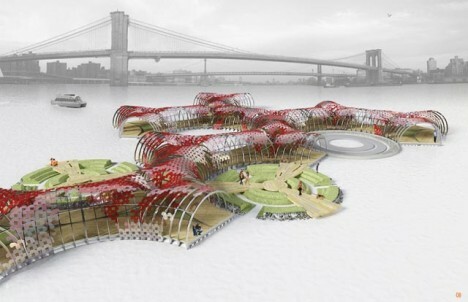 The floating system not only harnesses and stores powers from the tides in the river, they also extend public green space and create tidal pools for wildlife. The energy produced by the network of docks could be used to power street lights throughout the city.